The SQ-420 & SQ-520 can be used two ways - they can be connected to a computer for real-time measurements using the provided software, or when simply connected to a power source, can act as a stand-alone datalogger capable of storing 10,000 measurements internally that can then be uploaded to a computer for analysis. 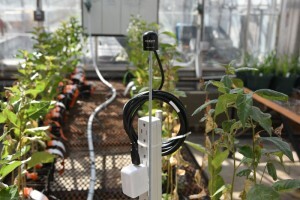 Used to measure incoming and reflected PPFD around plants and other organisms in outdoor environments, greenhouses, growth chambers, and underwater. The sensor has internal data storage capability with the ability to hold up to 10,000 measurements. This allows the sensor to collect data while connected to a stand-alone 5 V DC power supply such as an independent battery pack or USB wall adapter. No datalogger required. The sensor can be connected to a desktop, laptop, or tablet computer via USB 2.0 type A plug to be used with the Apogee software. 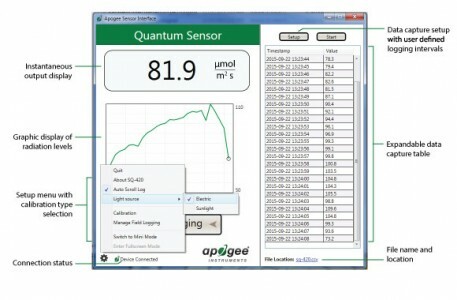 The included Apogee software gives the user control of data logging and calibration settings, provides a real time output display and graph of PPFD measurements and allows the data set to be saved as a csv file. The SQ-520 has an enhanced spectral response making it suitable for both sunlight and electric light.